The over-50s are being driven to "wrap rage" by hard to remove food packaging, according to a survey. Bleach-bottle tops, shrink-wrapped cheese and ring-pull cans are top of the list of older shoppers' pet hates. A poll of 2,000 Yours magazine readers found 99% thought packaging had got harder to open in the past 10 years. In fact, 71% of readers of the magazine aimed at the over-50s said that they had been injured as they struggled to open food packaging. And 97% thought there was just "too much excess packaging". "Hard to open packaging isn't just a dangerous nuisance, it discriminates against the weak," said Valery McConnell, editor of Yours Magazine. In the survey, the most common injury from trying to open packets was a cut finger, followed by cut hand, sprained wrist, bruised hand and strained shoulder muscle. Six out of 10 of those questioned said they had bought a gadget, designed to make packaging easier to open. Most people used pliers, scissors, rubber gloves and knives to try to prise open products. Many older people found they even struggled to remove price labels from gifts such as CDs and books. 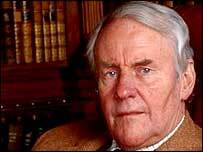 TV sitcom star Richard Briers told the magazine he too had problems unwrapping basic household goods. "My biggest bugbear are childproof lids on things like mouthwash," he said. "Ann, my wife, usually asks me to open a bottle early in the morning when I'm weak and it's a heller because you have to push really hard before you twist." 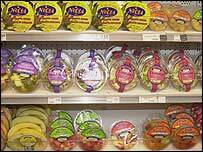 Presenter Gloria Hunniford also said she had problems with packaging. "Once I was being interviewed alongside a very important conductor on radio when coffee was brought in. "Whilst trying to open a milk carton I tore the corner off with such gusto the entire contents went down his gorgeous black suit - and he was heading off to the Albert Hall for a concert."